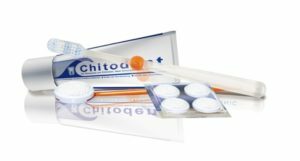 Archiv der Artikel die unter der Kategorie 4.Finger toothbrush, Microfibre finger toothbrush Trevira® bioactive-Faser (bioactive fibre) gespeichert wurden. Microfibre finger toothbrush – brilliant white teeth and dead microbes. The silver in Trevira® bioactive fibre guarantees antibacterial activity. The antibacterial effect is not reduced by frequent washing or use. The inorganic silver is anchored in the fibre polymer. (including the polymer matrix) and counteracts the colonization/growth of microorganisms and odours in/on the finger toothbrush.